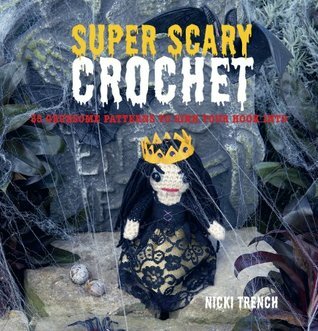 Not being a fan of horror, perhaps Nikki Trench was the wrong person to put this book together. When you add together the lack of clear instructions for some aspects, the weird (and not in a good way) descriptions for the projects, and the outright offensiveness of some projects (so a goth girl is someone to be ridiculed, a Halloween spectacle? ), this is just not a good book. I had high hopes for this one, but doubt I'd make many of the projects. The cobweb bunting is cute, but otherwise, quite disappointed. Some of these are pretty terrible. I really love this one pattern with a bunny that has a carrot sticking out of the torso. I also love the way Nicki did blood in this. Some really great ideas. very creative, and the title is accurate- "gruesome" indeed! Some fantastic patterns - cannot wait to get hooking again! !